The Premium 28” award rosette ribbon is the perfect champion award ribbon of choice for dog shows, cat shows, fairs, festivals, athletic events, equestrian competitions and much more. Let your imagination and creative energy run wild to celebrate that special moment of achievement for your event. 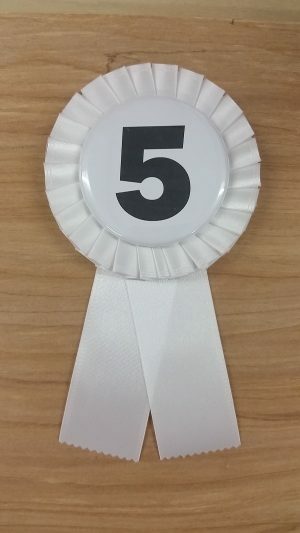 It can be totally customized to create a unique award ribbon for your special event or occasion. Made of high quality satin ribbon, it features a 2.25” button, 6.25” diameter pleated double rosette with 6 points and 3 streamers with a 2×24″ center streamer.